âWHERE have you come from?â asked one of the boys, as two figures with head-torches loomed before them. âEngland, UK,â replied one of the divers, to bemused murmurs. 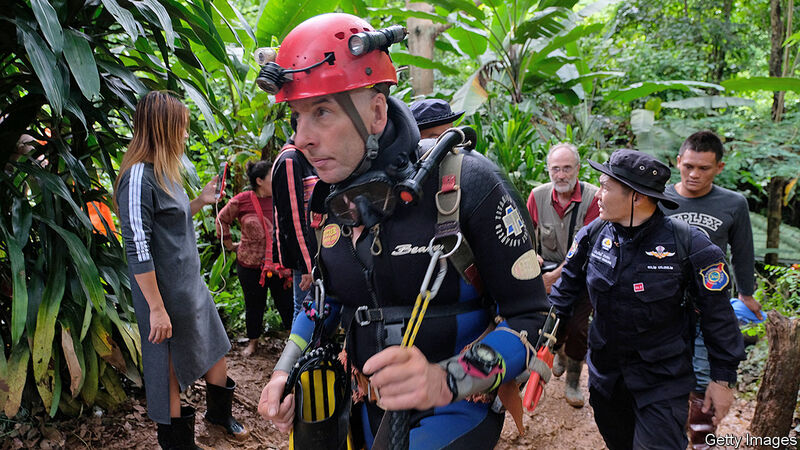 Specifically, the frogmen who had found the 12 Thai children and their football coach after nine days in a flooded cave system (see Asia section) were Rick Stanton, a retired fireman from Coventry, and John Volanthen, an IT consultant from Bristol. Despite their unremarkable day jobs, they are among the worldâs most revered sp elunkers. They hold the record for the farthest dive into a cave and have been summoned for rescues in France, Norway and Mexico. Their team in south Wales is one of 15 that comprise the British Cave Rescue Council (BCRC), which was called in when Thailandâs navy realised it would need help to locate the boys within a cave system that is 10km (6 miles) long. In a grim reminder of the operationâs dangers, Saman Gunan, an experienced former Thai navy SEAL, d rowned while supplying air tanks. Overall about 90 divers, including 50 foreigners from around the world, helped to bring the boys and their coach home and dry. The American armed forces and Australian police provided several helpers, but the mission appears to have been led by the BCRC amateurs, who eventually numbered seven. It might seem strange that British hobbyists are the first port of call for such high-stakes operations. Yet they, along with French enthusiasts, invented spelunking. A history of Derbyshire in 1777 mentions an early explorer who almost drowned while seeking a hidden cave. Britons created the brass diving-helmet in the 1820s, and vied with the French for underwater supremacy for the next century. British cave-divers improvised underwater breathing equipment with a bicycle pump and garden hose in the 1930s, and broadcast a BBC radio programme from an underwater cavern in Somerset. But it was Jacques Cousteau who pioneered modern scuba diving in 1943 with the aqua-lung, using a regulator to breathe compressed air from a metal cylinder. Today 28,000 people belong to the British Sub-Aqua Club. Though they have plenty of caves and mines to explore at home, many have ventured overseas. Indeed, the BCRC notes that Britons have spent years surveying Thailandâs vast network of caves. The groupâs latest expedition will make a particularly memorable entry in the logbook.